There's been a lot of debate recently about the value of U.S. currency, with the GOP now including an exploratory gold standard committee in its platform. But it's only the latest such argument in a debate that's rated almost since the nation was first settled. 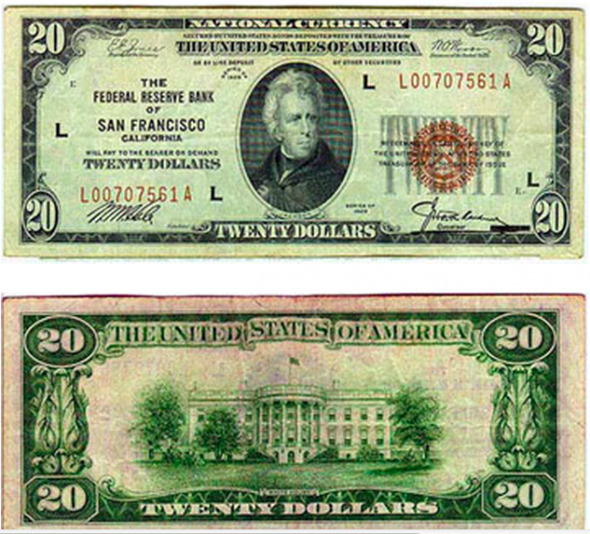 The San Francisco Federal Reserve and Doug Mudd, the curator of The American Numismatic Association's Money Museum, have helped guide us through the history of the $20 bill, from the colonial era to the present. 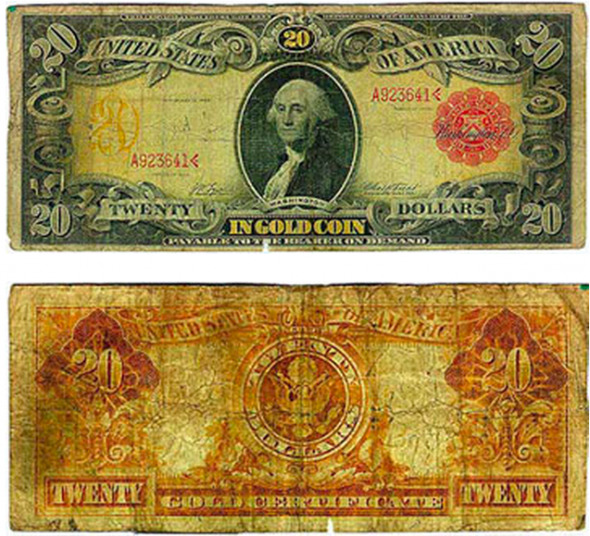 We were able to find $20 notes from every era of the country's banking history, from the colonial era to the present Federal Reserve system. We also included Confederate bills and notes issued by obscure local banks. We discuss what prompted the new bill to be issued — and whose portrait is on the cover. Colonies (and subsequently states) issued their own currency until the First National Bank of the U.S. was established in 1791. Twenty shillings were worth one pound. 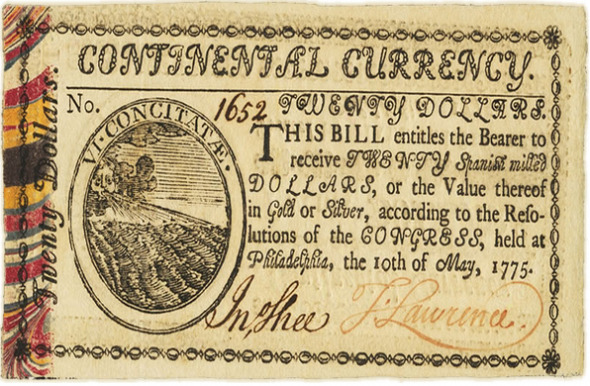 When the Continental Congress began to meet, establishing a national currency was deemed essential to asserting sovereignty. 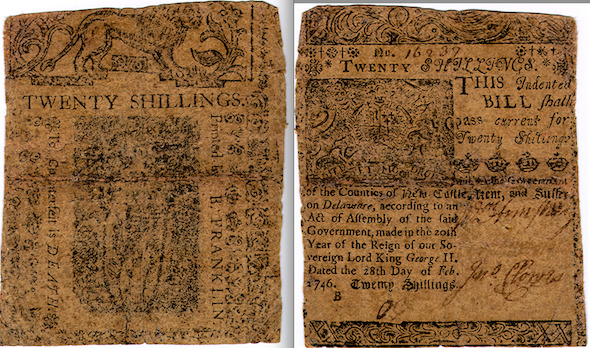 Colonial paper money rarely lasted very long because the colonies generally issued too much of it. The resulting inflation made the bills worthless and left a long, bad taste in citizens' mouths for paper money. Between 1791 and 1832, two national Banks of the United States were chartered in to solve this problem. Though private, they retained the power to issue money. After the second bank's charter expired in 1832, the period historians call "the free banking era" began. 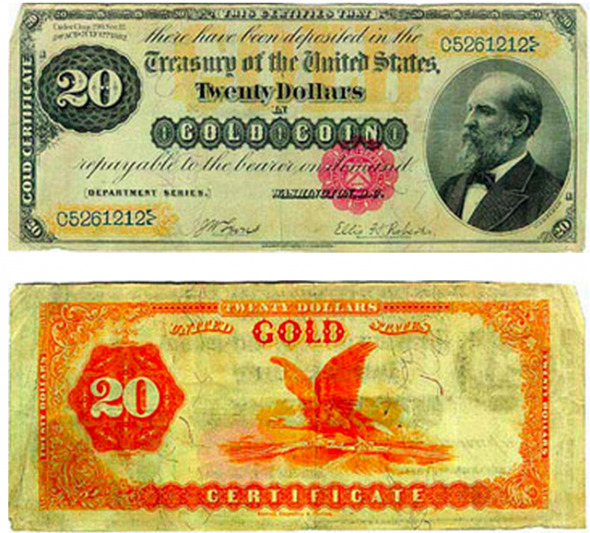 Banks big and small, as well as factories and railroads, began printing their own money. This led to a host of inter-county and town exchange rates, which had to be published in daily newspapers. The Civil War helped end the chaos. 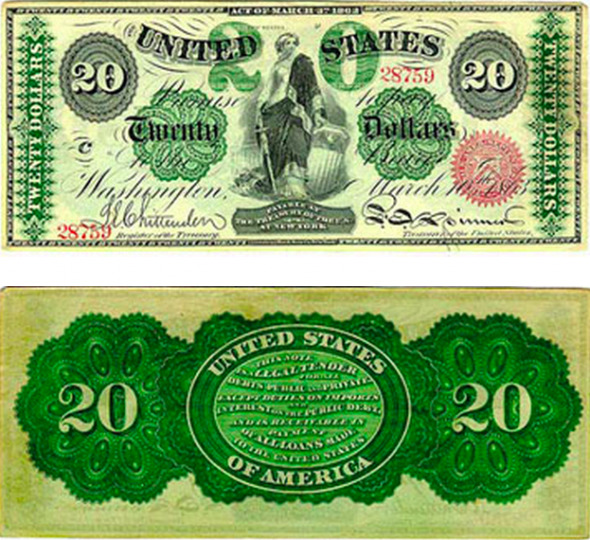 To finance the war, the Union authorized the first issue of paper money by the government since the Continentals. 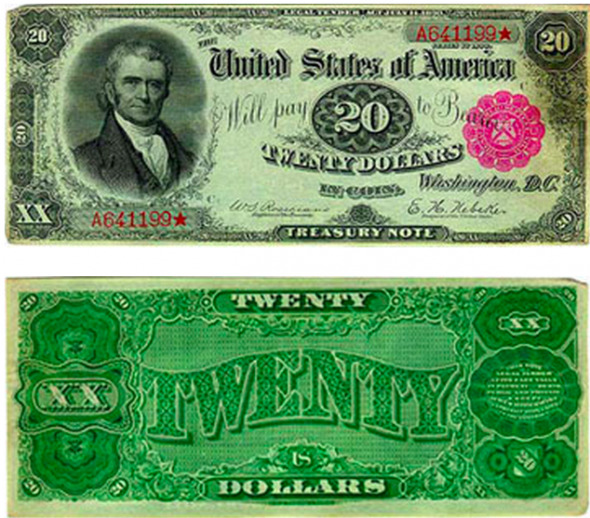 These 'demand notes' were printed for about a year in $5, $10, and $20 denominations, redeemable in coins on demand, and green in color — (which is where the phrase "greenbacks" comes from). About $10 million in notes were issued. 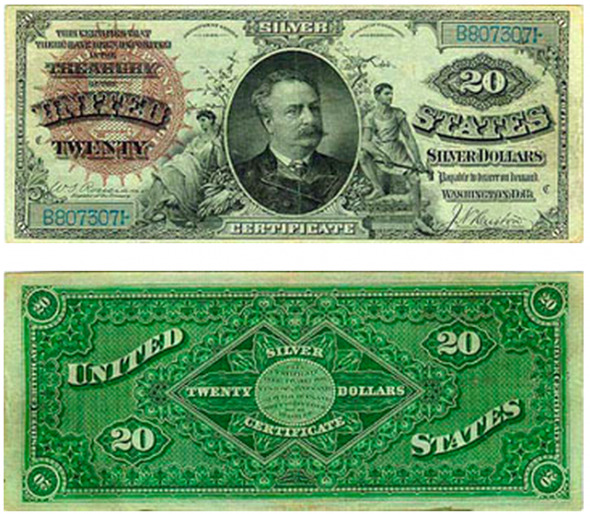 These notes, and all paper money issued since 1861, are still valid and redeemable in current cash at face value. In the middle of the war, Congress discontinued issuing Demand Notes and issued Legal Tender Notes. 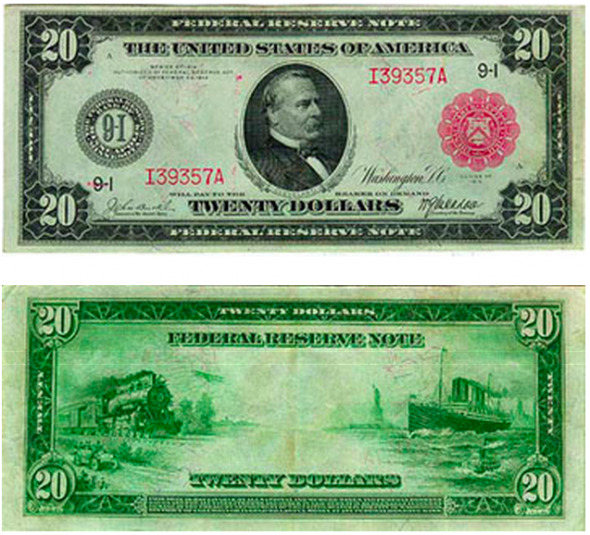 These new notes--issued in denominations from $1 to $1,000 (later $5,000 and $10,000)--were the first national currency used as legal tender for most public and private debts. 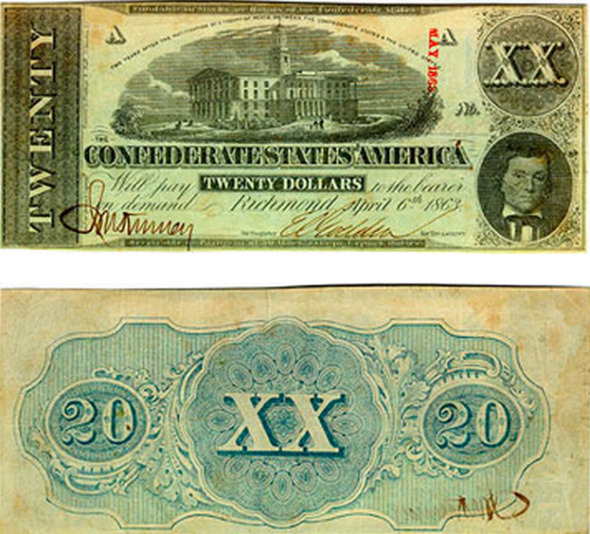 The Confederacy also minted currency, although inflation was a chronic problem. As the end of the war neared, Confederate citizens completely lost confidence in their currency and came to rely on barter or black-market greenbacks. 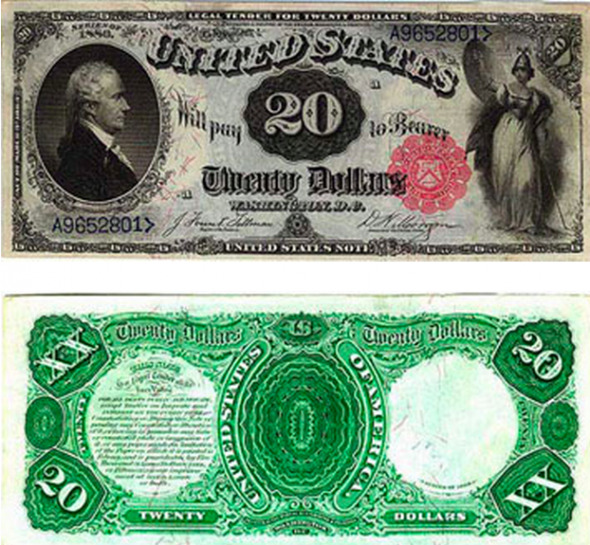 Another $20 bill, again with Stephens but this time with the Nashville, Tenn. state capitol. After the war, the government got its act together and set up a system of national banks. In the late 20th century, according to Mudd, this was the most stable paper money system in the world. 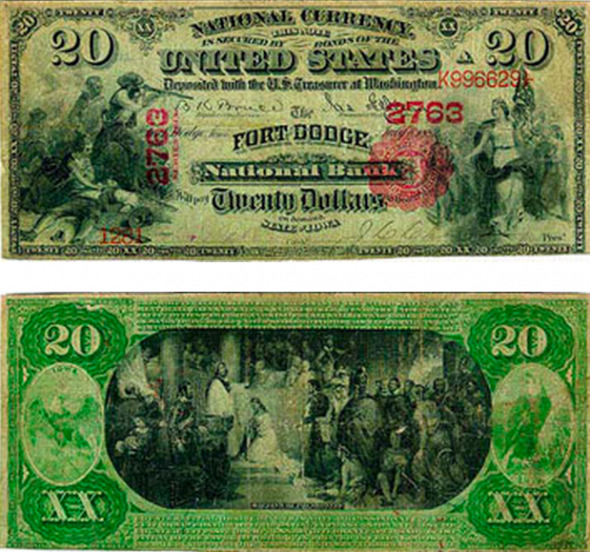 Between the Civil War and World War I, most paper currency circulating consisted of national bank notes. Another from the "national bank era"
Cover portrait: Battle of Lexington 1775, left; Columbia leading a patriotic procession, right. Reverse: Baptism of Pocahontas. 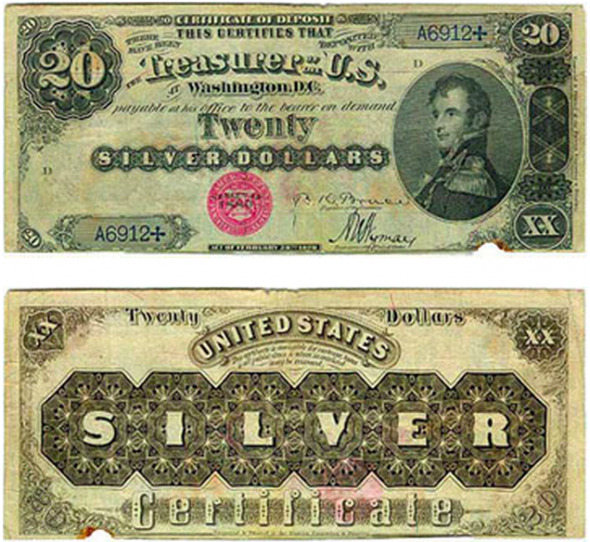 In a bid to increase demand for precious metals, whose value had plummeted to Wester mining booms, the government in the 1880s began offering notes backed by silver and gold. Another note provided in exchange for metal reserves. Notes were also issued for silver. But the "national bank era" ultimately gave way to bank failures, business bankruptcies and general economic contractions. The 1913 Act created the Federal Reserve System as the nation's central bank to regulate the flow of money and credit for economic stability and growth. 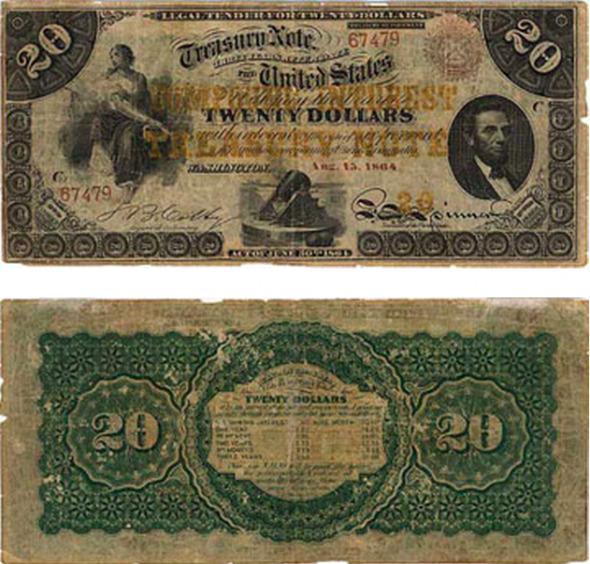 In 1914, Federal Reserve Notes were issued by Federal Reserve Banks as direct obligations of the Federal Reserve System, replacing national bank notes as the dominant form of paper money. Finally in 1928, Andrew Jackson appeared on the bill.